While on a survey out of Westport, Washington, Cascadia Research Collective encountered a southern resident killer whales including individuals from both K and L pods. 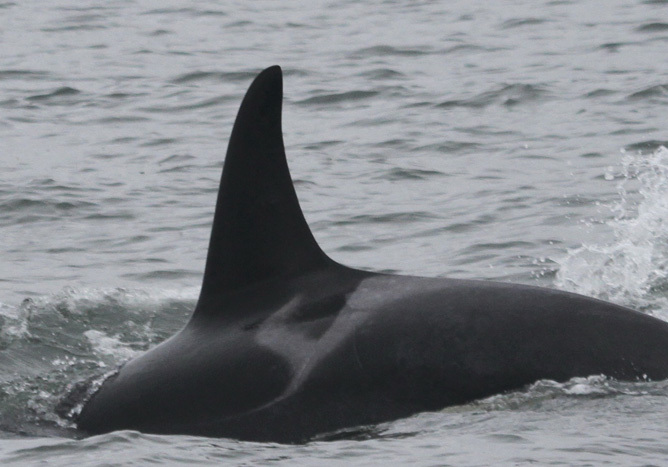 From the photos sent to the Center for Whale Research, we were able to ID 36 whales. This is not a complete census. Cascadia was able to photograpg many, but not all of the whales present. Here's a list of the whales we were able to ID from the photos: K12, K13, K14, K20, K25, K26, K27, K34, K36, K37, K38, K42, K43, K44, L5, L25, L27, L41, L53, L55, L72, L79, L82, L84, L85, L86, L89, L91, L94, L103, L105, L106, L109, L113, L116, and L118. Photograph of L105 by Greg Shore. It seems this is not the group L90 is usually with. Any sightings of her or her group? Thanks for letting us know about this. We've been on the seas of Westport, WA and we don't have knowledge about killer whales in the area. Good thing I have read your post.